Christmas is one of my favorites times of the year. This holiday season, I want to read some more good books, and continue to have good health and peace of mind. If you’re striving for greatness as a hitter, there are three gifts that I recommend you have under your Christmas tree. Written by St. Louis Cardinals manager Mike Matheny and Jerry B. Jenkins, this New York Times bestselling manifesto details what parents, coaches and athletes get wrong about sports. It also provides eight keys to success that sports can help deliver. The tee is one of the greatest inventions known to baseball and softball players, especially if you’re striving to become a professional hitter. According to author Malcolm Gladwell, it takes 10,000 hours of deliberate practice in order to develop a skill. For example, it took no less than 10,000 hours of practice to develop the successful habits of Dr. Martin Luther King, Jr., Tom Brady and Michael Jackson. I would argue that it takes 10,000 hours of being lazy to avoid becoming a Major Leaguer. Here’s one of my favorite drills that you can execute on your brand new Tanner Tee. I’m a visual learner. If that works for you, the Dartfish Express app can help capture, analyze and share your swings. Remember: Intelligence tops being smart. For more information, visit www.diamonddirectors.com today. Also, check out our Digital Magazine. C.J. Stewart has built a reputation as one of the leading professional hitting instructors in the country. 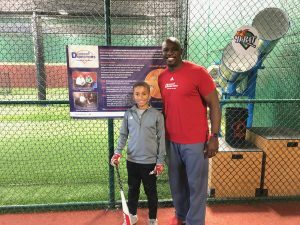 He is a former professional baseball player in the Chicago Cubs organization and has also served as an area scout for the Cincinnati Reds. As founder and CEO of Diamond Directors Player Development, C.J. has more than 12 years of player development experience and has built an impressive list of clients, including some of the top young prospects in baseball today. If your desire is to change your game for the better, C.J. Stewart has a proven system of development and track record of success that can work for you. CJ Stewart's 3-Video Series: A must for every parent and hitting instructor. * Lessons must be completed within 30 days of lesson. This includes rescheduling.